A big part of the Grasshoppers culture revolves around tours. These have mostly been overseas tours although in the early years the Grasshoppers made short tours to England to coincide with Ireland matches. The English tours have largely disappeared due to the radical changes in the Ireland set-up in modern times where the team travels all over the world. By 2017 the Grasshoppers had completed 18 major overseas tours stretching from 1981-2017. Manager: Dixon Rose, Captain: Graham Crothers. If there is one thing that sticks out when reflecting on a tour that took place over 35 years ago it is how much we crammed into a couple of weeks. 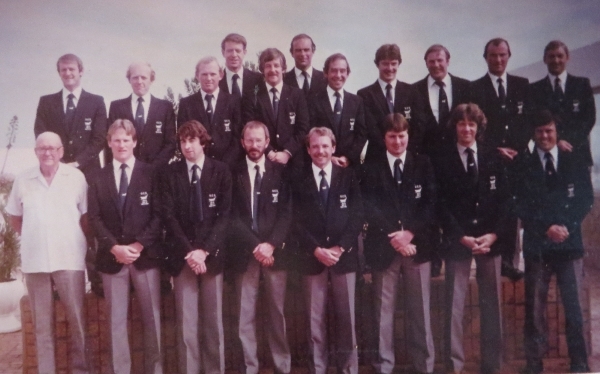 Looking back at the inaugural 1981-2 Grasshoppers Tour to South Africa it was an unforgettable experience, not least because of the hospitality we received, the famous people that we met and the strength of our squad. 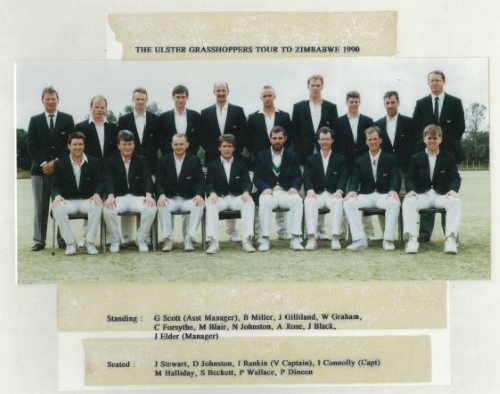 This was arguably the strongest ever Grasshoppers touring party as it contained eight Ireland internationals, six Interprovincial players, an Ireland umpire, three useful club cricketers and a demon of a supporter in Charles Corlett, Simon’s father, who joined us in South Africa. I doubt if there was ever a more energetic and partisan father of a sporting son and I don’t think we’ll ever meet anyone to match his after-match revelry, repertoire of rugby songs or consumption of alcohol. Charles was the consummate tourist and did much to enhance our experience. Whoever appointed the Manager and Tour Captain certainly had a sense of humour as Dixon Rose and Graham ‘Doc” Crothers were rarely on the same page, but with the experienced Dermott Monteith, Alfie Linehan, Paul Jackson, Stephen Warke, John Elder, Chris Harte, and Simon Corlett on board there was never any chance of things getting out of hand. Indeed it was a remarkable tour for camaraderie as everyone got on with each other and the Grasshoppers ethos of touring was built on the friendly spirit this tour stimulated. Prior to the tour a lot of preparatory work was put in by Phillip Nixon, Jimmy Kirk, Graham Crothers, John Elder and Phillip Billingsley, while the North of Ireland overseas professional Kevin Skjoldhammer was an important and very efficient organizer at source. There was also an inherent element of controversy involved as the tour was held during the Apartheid boycott and the high profile composition of the squad inevitably attracted criticism. Not surprisingly, the Northern Cricket Union and the Irish Cricket Union distanced themselves from the tour and pointed out it was a private tour outside their jurisdiction. And so the party slipped quietly out of Ireland on a cold late December morning in 1981 and headed for South Africa on a very circuitous route, compliments of Gullivers Travel and Air Portugal. Despite the long journey there were compensations, not least the copious supply of wine and if anyone didn’t know much about each other prior to the tour, they certainly did after 18 hours travelling and drinking. Our arrival at Jan Smuts International Airport in Johannesburg was an event in itself with South African Cricket President Ali Bacher and his colleagues treating the party to a champagne reception to set the tone for two weeks of supreme hospitality and friendship. Settling in at the Holiday Inn was quick and painless with Manager Rose in complete control and the following two days of acclimatization involved a day at Wanderers Cricket Club and lunch as guests of the local Press Association and some practice at the world-famous sports resort. New acquaintances quickly became friends and the delivery of 24 cases of the best local wine cemented friendships forever, not least with the recipients in room 904 Messer’s Maurice Moore and Clarence Hiles. The tour shebeen was established although card schools were played in Billy Kirk’s room. The first match against Sir Wilfred Isaac’s XI at Wanderers resulted in a surprise 60 runs defeat against a useful team that included former South African captain Roy McLean and New Zealand captain John Reid, who was on holiday visiting his son. It had nothing to do with the two-hour lunch break and early tour revelry, but more about jet lag as the batting crumbled after a promising start from skipper Crothers (41) and Stephen Warke (39). The second match against the Kent Park Taverners at the picturesque Auckland Park, home of the Johannesburg Country Club, started in beautiful sunshine and the only distraction was the sumptuous lunch being set up on the boundary. Phil Nixon (40) and Jimmy Kirk (45) were not deterred and a healthy 183-8 allowed skipper Monteith the luxury of a declaration. In reply, John Reid hit some ferocious drives, but nobody saw a hail shower creep up and everyone was sent scurrying to the clubhouse leaving the splendid BBQ in tatters. However, the lunch in the clubhouse was five-star and it took a lot of coaxing to get both teams back on the field. The hailstones had transformed the wicket into a seamer’s paradise and Monteith claimed that for 15 minutes Hiles was “the most unplayable bowler in the world.” However, it was a short respite and the rain followed to wash out the game and send everyone back to the bar. In between games there was plenty to see and experience not least the apartheid system in place. Everyone is entitled to their opinion on the South African political regime, but for this writer the system was abhorrent and it came as no surprise that it was eventually toppled a decade later. Kevin Skjoldhammer was an excellent host and with Charles Corlett now in full swing news of the social side of the tour was spreading fast around Jo’burg. The New Year was brought in at the Skjoldhammer residence with plenty of refreshments, good company and a magnificent BBQ. Unfortunately the tour manager ‘slipped’ and fell into the pool, but that apart it was another night to savour. Next day we faced the Pirates at Greenside without cantankerous Billy Kirk who somehow ‘missed’ the bus after the tour manager reinforced some discipline with tighter timekeeping. Bill was not amused! However, we enjoyed the company of Ireland rugby stars John Robbie and Frank Quinn, plus John Lyons who played at Bangor and in Dublin for a few years. It was a good day for the Grasshoppers as we won our first match on tour by 36 runs with five-wicket hauls from the masters Monteith and Corlett, and a fine half-century from the suave Jimmy Kirk (57) and a quickfire 30 from the lively Jacko. Cricket tours are not just about cricket, so when a trip was mooted to spend a day at the Sun City Million Dollar Golf Classic a party quickly gathered. Brian Ferris and Simon Corlett were the drivers, navigators and mechanics and although we got lost a few times exiting Johannesburg, we inadvertently got the chance to see Soweto first-hand and it was not an experience we’d like to repeat. Also, on the journey we had a puncture, but the very capable “man for all seasons” Simon Corlett, quickly got us back on the road. John Elder stayed on to meet friends and enjoy the big Glen Campbell concert while the rest of us headed back into the most spectacular electric storm imaginable, but happily we all got back safe and sound. The tour was split between Johannesburg and Durban with a match planned in Pretoria. We drove down to Durban and got a chance to enjoy the unique beauty of Africa before arriving at the seaside capital of Natal. Durban was very different than Johannesburg and our new home at Seaboard Holiday Apartments was more akin to a holiday resort than a base for serious athletes. We also discovered the best value in the country at the “One Rander” restaurant where you could enjoy a sirloin steak with chips and salad for 1.45 rand. Hamburgers were 60 cents and desserts 20 cents. Obviously it was popular with the tourists! Unfortunately the match at Pretoria was rained off, but we played three games in Durban against the Missionaries (Durban High School Old Boys), Umzinto CC and the Caine Rats CC. Against the Old Boys we won by 135 runs thanks to Warky’s fine 82 and Simon’s 53 not out, with four wickets from seamer Hiles and the others shared between Corlett and Monteith. We scrambled a narrow one-wicket win over Umzinto chasing 78 with too many hangovers and we won our final game against the Caine Rats by 96 runs. Big hitters Brian Ferris (51), Stephen Warke (48) and Davy Napier (23) were rampant and Bilko was the best of the bowlers with three wickets. In Durban we also had a golf game where Alfie spent more time in the bush than on the course and we met up with Neville Daniels and spent a day at the big Datsun Shield Natal versus Transvaal match at Kingsmead. The cricket featured South African greats Mike Proctor, Clive Rice, Graham Pollock, Barry Richards and West Indian Alvin Kallicharran, but the day will be best remembered for a drinking session that started harmlessly in the hospitality tent and eventually “put out the lights” of most of the participants long before the end of play. But all good things come to an end and after saying goodbye to Africa we returned to snow-clad Britain after surviving a horrific electric storm over the Sahara Desert that had everyone saying their prayers. Worse was to follow when we arrived in Dublin and had to suffer the horror of a road trip north through some horrendous roads covered in deep snow. But we all made it home to tell the tale and over the ensuing 35 years to reflect on a wonderful tour. Friendships were made on that tour that have stood the test of time and although our dear friends Charles, Dermott and Phillip have passed to a higher calling we can still sit down 35 years later with any of the tourists and reflect on some unforgettable happy experiences. That’s the legacy of the 1981-2 South Africa tour. The 1990 Tour of Zimbabwe was a wonderful trip-impeccably organised by John Elder and thoroughly enjoyed by everyone. Our team was strong-good solid cricketers who could all perform well on the pitch, but also after the match, when they could relax have a beer, chat to the opposition and watch the sun go down. There some stand-out performances that come quickly to mind-a couple of the pace bowlers wrecked the bar in Wedza, and John Gilliland (who didn’t like the sun) would wrap himself in more clothes than a man would wear on a frosty morning in Comber, cover himself in sun block, and then play beautifully. We won all our matches (bar a 20 over bash) climaxing with a great performance to beat Mashonaland Districts on our last day. This was a wonderful tour which produced lasting memories for everyone. The Ulster Grasshoppers CC embarked on a short but memorable trip to the beautiful island of Malta playing two fixtures, recording two comfortable victories. The trip was organised by yours truly and Andy Beattie of Waringstown CC, a first time tourist to whom I am endebted for his assistance from start to finish. The tour party totalling 17, was a nice blend of experience and youth with a few non players and to keep everyone in line, Dawn Callendar. Dawn has toured with the Grasshoppers before and was great company even though she heard some serious drivel from some of the tourists. She took it all in her stride and I hope her and her husband Ian (our umpire for both games) tour again with us. This tour party only had five previous Grasshoppers, Ian and Dawn Callender, Peter Bates of Muckamore CC and Ricky Finlay and Michael Turkington of Lisburn CC. The remaining party consisted of Les Irwin and Colin Storey from Woodvale CC, Matty McCord and Brian Anderson from Cliftonville CC, Andy Beattie, Alan Harrison and Rab McClimond from Waringstown CC, Stevie Colgan of Ballymena CC, Glenn Halliday and Calum Atkinson of Lisburn CC, Corin Goodall of CSNI and Blair Stewart our chief supporter. The party blended well and while many of the young guys didn’t know the older ones, it certainly wasn’t the case after the weekend and lasting friendships were formed. The second fixture was on Sunday v our hosts, Marsa. Marsa opener Nowell starred for the home side with 91 including 7 fours and 4 sixes, but had little support chasing Grasshoppers 213 for 4 in the 30 over match. Calum Atkinson and Andrew Beattie both picked up 2 wickets for the Grasshoppers as Marsa finished on 173 for 8. Colin Storey was thrown the ball mid innings and ‘Big Sto’ showed the younger lads that the adage ‘bowl straight’ still rings true, by clean bowling the opposition number 4 first ball of his Grasshoppers career. Experience etc etc. Earlier the Grasshoppers batsman all achieved double figures with no less than three retiring early to protect their averages. NCU Cricket Development Officer Calum Atkinson top scored with 54 not out whilst fellow opener Michael Turkington fell 5 short of a deserved half century and Andy Beattie’s 29 was scored in only 19 balls. So, the Grasshoppers finished their Malta tour unbeaten. The awards night the final evening was, in true Grasshopper style, good fun and with the ‘warm beer loosening tongues’, gentle cover drives had in fact scorched to the boundary, simple catches were one handed stunners, and Batesy’s wicket keeping was in fact, on a par with former Grasshopper / Ireland skipper, Paul Jackson in his pomp. Roll on the next tour!